CHARLOTTE, N.C. – With rapid global urbanization driving demand for large-scale, high-efficiency cooling, Carrier announces the introduction of the new AquaEdge 19XR/XRV chiller, which will be released in various sizes throughout 2014. Featuring a two-stage centrifugal chiller with heat pump capability and an initial capacity from 800 up to 2,250 tons, the AquaEdge 19XR/XRV provides environmentally responsible, reliable and quiet operation for a variety of large-scale projects including data centers, large commercial buildings and infrastructure projects. Carrier, the world's leader in high-technology heating, air-conditioning and refrigeration solutions, is a part of UTC Building Industrial Systems, a unit of United Technologies Corp. (NYSE: UTX). "Carrier again extends the boundaries of innovation with its new AquaEdge chiller," said Geraud Darnis, president CEO, UTC Building & Industrial Systems. "From the day Willis Carrier invented modern air conditioning, we've worked to offer our customers intelligent and sustainable products. Today, we are proud to introduce yet another advanced, reliable and efficient cooling solution to enable cities of the future." AquaEdge 19XR/XRV, which will expand its offering up to 3,000 tons later this year, delivers numerous benefits from efficient design to streamlined installation. 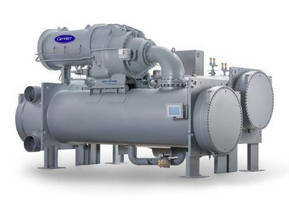 The two-stage centrifugal chiller line complements the existing 19XR/XRV line of single-stage chillers that is available from 200 to 1,500 tons. With a constant-speed full-load rating of 0.53 kW/Ton and integrated part load value down to 0.49 kW/Ton, it provides improved efficiency for larger projects. The unit's compact system footprint also makes it ideal for existing building upgrades. In addition to its efficient design, AquaEdge uses HFC-134a, a non-ozone depleting refrigerant. "By 2050, it is estimated that 70 percent of the world will be living in urban areas," added Darnis. "Energy efficiency in both current and future buildings is critical to accommodate the growing urban population without further straining global resource availability and environmental quality. We clearly have a great opportunity to offer building owners and operators a solution that will contribute to sustainable operations." As part of the product launch, Carrier's established 19- and 23- series Evergreen chillers will adopt the new AquaEdge product family name. Built with proven technology, this addition increases the line's capacity range, while providing a simplified naming structure for streamlined future portfolio expansion. The AquaEdge line rounds out Carrier's new Aqua Series, which includes the smaller-capacity AquaSnap® and the medium-capacity AquaForce® units. AquaEdge chillers are currently available throughout Asia and will be available for order worldwide in early 2014. To learn more about the Carrier AquaEdge chiller, as well as the company's other energy management solutions, visit www.commercial.carrier.com and follow Carrier on Twitter: @CarrierGreen.